If you use social media for your blog, you will have heard plenty about the changes in algorithm on Instagram. Facebook bought Instagram and started making changes, now the photos don’t display in chronological order. Instead, they are displayed by what Instagram thinks you might like. The algorithm is complex and takes lots of things into consideration to tailor the feed to each person. In simple terms, if you always like and comment on Missguided’s photos for example, chances are you will see their content at the top when you log in. The algorithm knows you are interested in that account, so will continue to display it to you. 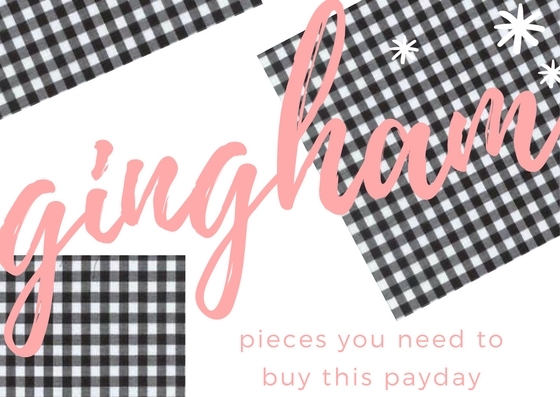 Bloggers have commented that these changes are affecting their engagement stats. Their photos are being seen by less people, and therefore less likes are received. I’d heard a few people talking about Instagram pods on Twitter and decided to join a few to see what they were like, people claimed they helped your stats. An Instagram pod is a group of bloggers who create a message trail in the Instagram inbox and promise to engage with one another. Generally, the rules are you must follow everyone in the group and they will follow you back. Then you must comment and like everyone’s latest post when they send it to the group. Ideally, comments should be at least 4 words, apparently, this helps with the engagement algorithm. The idea is everyone comments and likes each other’s so you will see the benefit too. I have found that joining a few pods has increased the number of likes and comments I get on each post, which is a positive. I have also gained followers as this is part of the rules of joining. It hasn’t dramatically changed my numbers but it helps ensures that my content, which took time and effort, is being engaged with. The downside to these groups is people can’t keep up with the posting. In some larger groups there are 10 or more photos you need to comment on in a day. If you are extremely busy all the time, it’s hard to manage. People also drop out of groups without saying anything or even unfollow you for no reason, but this does vary. I’m currently in 7 groups and I manage to check a few times a day and give a quick comment and like to stay updated. 3 or 4 of the groups are very chatty and supportive, some are just for posting photos. 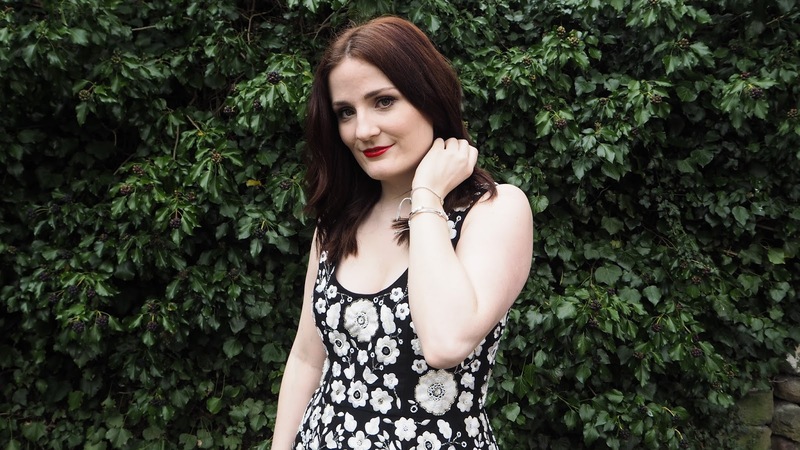 I do think they help with engagement on a small level, but I’ve also enjoyed finding new content from other bloggers in the groups who I wouldn’t normally have followed. If you’d like to join a new group, please let me know and I’ll create a new one if enough people are interested. Also, a cheeky Instagram plug, you can follow my Instagram here. 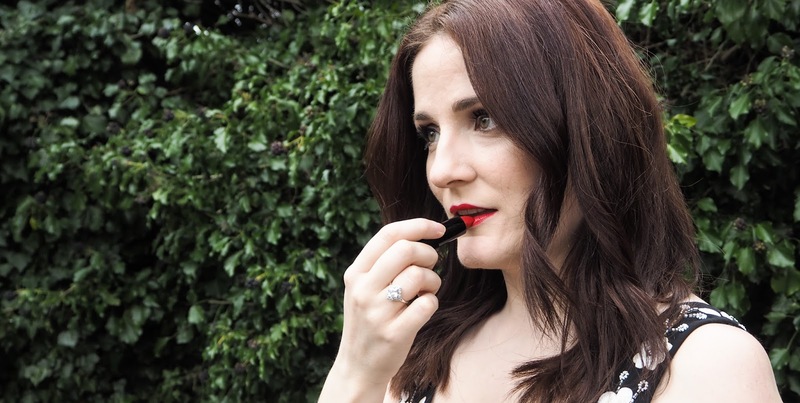 "Put on some red lipstick and live a little"
There is something so empowering about red lipstick. It instantly makes you walk taller and feel more confident. As you might have guessed I adore the contrast between my Snow White skin and cherry-red lips. Armani's famous red shade, 400, has become my all time favourite. It's a beautiful suits-all red, which reminds me of the colour of the soles of Christian Louboutin shoes. The shade is available in every lip colour formula they sell so you can pick and choose what finish you would like. Their Lip Magnet formula is for those who love a liquid lipstick, whereas Rouge Ecstasy range is super hydrating. I'm wearing the Rouge d'Armani version of 400, which has a stunning satin sheen and feels very moisturising on the lips. The consistency is so light but it is also very pigmented, making it the best of both worlds. The sleek black packaging mirrors the tailored, stylish fashion pieces from the brand and the magnetic closure gives a satisfying click, signalling a high-quality product. 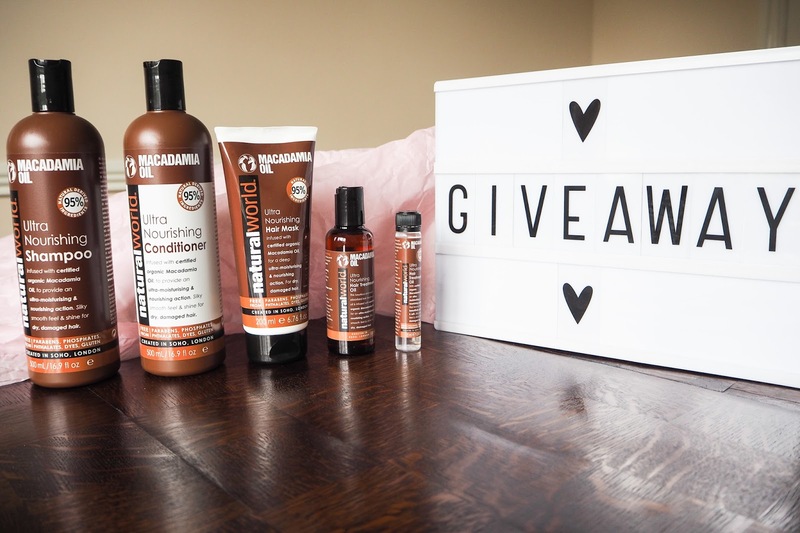 Macadamia oil has become a staple ingredient in haircare over the last few years, and for good reason. The oil is well known for it's hydrating and nourishing properties, making it popular in de-frizzing or moisturising hair products. I have naturally curly and frizzy hair and it always feels soothed after using a product that has this ingredient in. 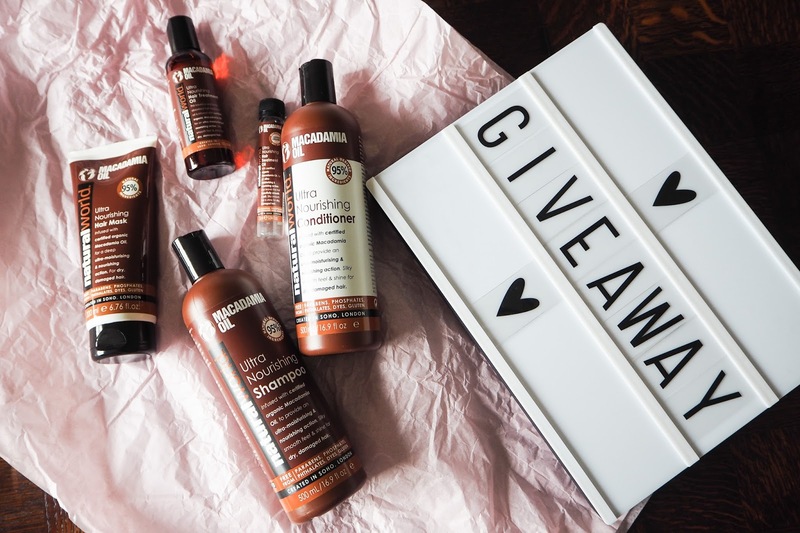 Natural World is a haircare range which contains 95% natural ingredients and is made in Soho, London. Their Macadamia Oil range is free from parabens, phosphates, and dyes, but it's also certified organic. The competition is open to UK entrants only. Please use the Rafflecopter entry form below to submit your entries. 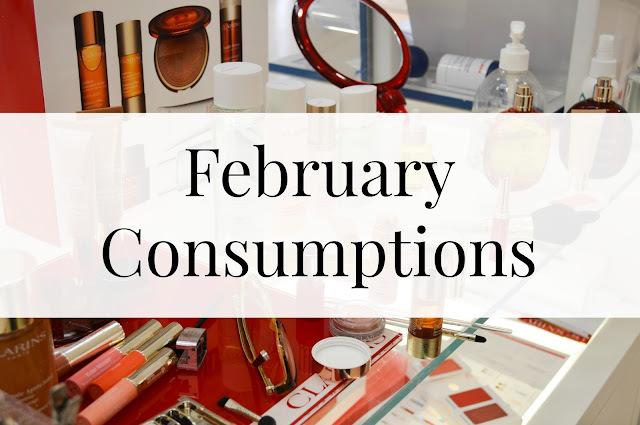 If you missed my January Consumptions post, I’m on a mission to use up products throughout the year as well as having a clear out of my makeup collection. I managed to make my way through quite a lot of products in February so I’ll keep things short and give you a quick overview of each product. I haven’t kept packaging to photograph as I have nowhere to store it. This isn’t the one which was created by Caroline Hirons, it’s the original formula, which almost feels like a wax. 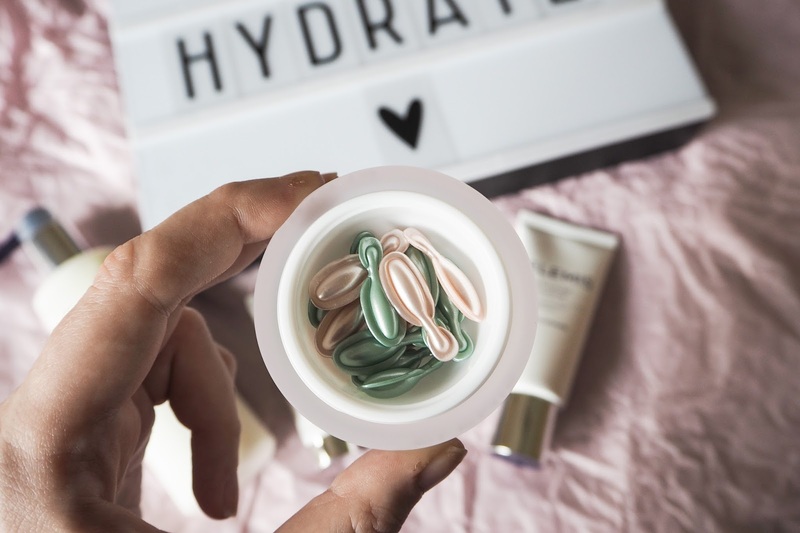 A little goes a long way and it does remove makeup while nourishing the skin. My lips have been dry due to my Roaccutane treatment so this helped scrub off flaky bits. One of my favourite Christmas bath bombs, it’s a lovely scent and doesn’t have a tonne of glitter, which I am not a fan of. This little bubble bar smells a little like strawberries, I adore it! I always stock up at Christmas. If you love the Snow Fairy scent, this bath bomb would be ideal for you. Again, smells like Snow Fairy, everyone’s Lush favourite. I received this in a goody bag, it’s a little bit of a novelty. It’s a cardboard like texture which you run under water to foam. I wouldn’t purchase again as it doesn’t last more than one wash. If you couldn’t tell I love the Snow Fairy scent. I have back-ups of this. I bought this on The Anna Edit’s recommendation a while ago and fell in love. Simple and effective, I will always repurchase. Amazing at providing heavy coverage. I would recommend to anyone with oily skin. I loved this mascara, it didn’t flake or smudge and provided fluttery lashes. Yes, I’m guilty of using face wipes out of laziness. I find they remove mascara better than just a cleanser. I usually cleanse with a balm or oil after using them as well. This cost about 80p so it wasn’t amazing quality but had a nice lavender scent. I loved that this was quick to use but it did leave a slightly greasy residue on my hair. One of my favourite night time fragrances. I recommend you smell it at a counter as it’s very unique. I also went through my collection and tested and smelt products that I thought might have passed their expiry date. This used to be the best bronzer on the high street, but so many other brands have better quality ones now. The texture of this is mousse like with a little bounce, loved the formula. It just wasn’t a very wearable shade so didn’t see much use. Lovely copper shade, I just have so many eyeshadow sticks that this was forgotten about. Not sure if the whole range is like this, but it was very chunky glitter in the formula. This has seen so much love over the years, but it was way passed its expiry date. I don’t think they do this shade anymore. I wore this colour so much and I adore the gel effect formula, as it’s so long lasting. It had just gone a little thick and gloppy, I will need to replace. I’m an avid tea drinker and drink around 4 to 5 cups a day. The only downside is that tea stains your teeth. I’ve always thought that teeth whitening was best done at a dentist but Janina Ultra White have a number of options to help you change the colour of your teeth at home. They offered to send me a bundle of their products to review so here is what I thought about the range. For those who want the biggest results, I would recommend their Pre-Filled Trays. The set contains 10 trays, 5 each for top and bottom, so you are covered for 5 days. They are a one size fits all shape, which might mean it’s not extra tight on the teeth but the ingredients will still coat your teeth. You just wear them for 35 minutes a day to help brighten the shade of your teeth. They also have an Activated Charcoal Toothpaste which is suitable for daily use. This would be ideal for those who want to see long-term benefits and have a continuous teeth whitening routine. I find some teeth whitening toothpaste have a horrible taste and this one is minty and fresh. It’s so easy just to switch your toothpaste out and see the results. Similarly to the toothpaste is the Clean & White Extra Fresh Whitening Foam. It's a bit of a novelty as it has oxygenating properties which foam up in your mouth. It does help to reach those hard to get places though and the foaming sensation makes your mouth feel extra fresh. Janina’s Instant Teeth Whitening Spray means you can freshen up your smile in an instant while on the go. You just simply spray the product into your mouth and swish for a minute and then spit the liquid out. There is no toothbrush required. 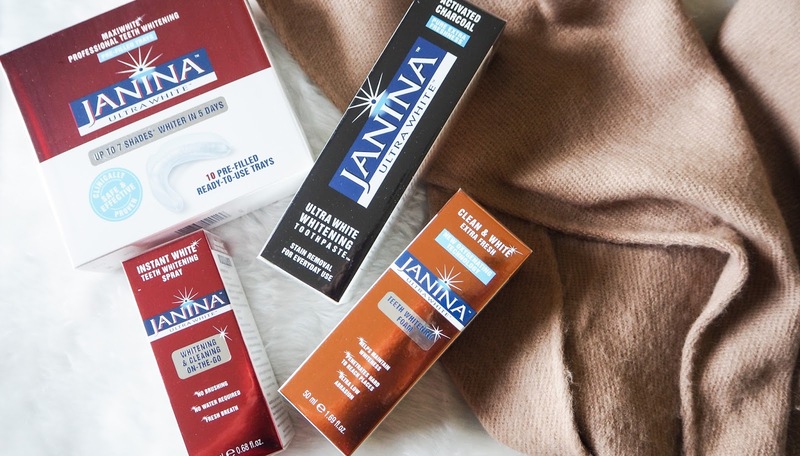 I enjoyed using the products Janina sent out to me, and they really have helped to whiten my teeth. I think the range has something for everyone, so check them out if you need ‘at-home’ teeth whitening products. Bee venom in skincare, what is it and what does it do? As you know bees don’t generally sting and venom is something that is normally associated with snakes, so this term can be a little confusing. Bee venom is actually a defensive toxin produced by bees. From my research, it is collected by lightly electrified glass. The bees are attracted to sting the glass; thankfully their stingers won’t get caught, so they don’t die in the collection of this ingredient! 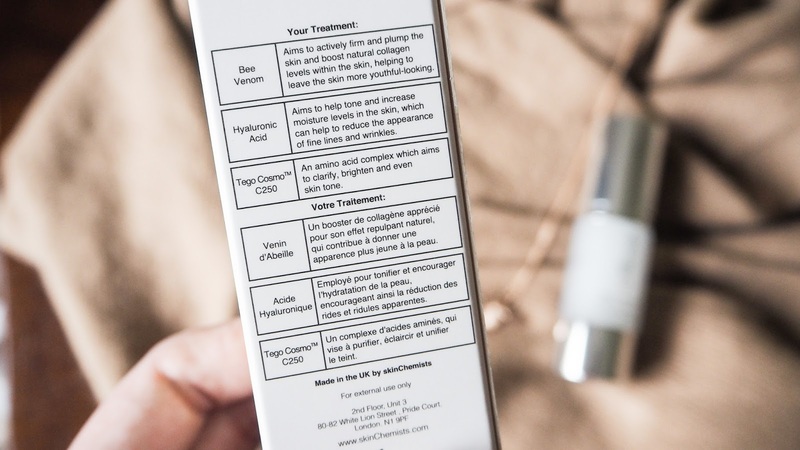 Skin Chemists have created their Bee Venom Facial Serum to plump, hydrate and stimulate the skin, leaving it looking more youthful and reducing the visibility of fine lines and wrinkles. The ingredient fools the skin into thinking it has been stung, so the blood circulation increases in the areas that it has been applied to. 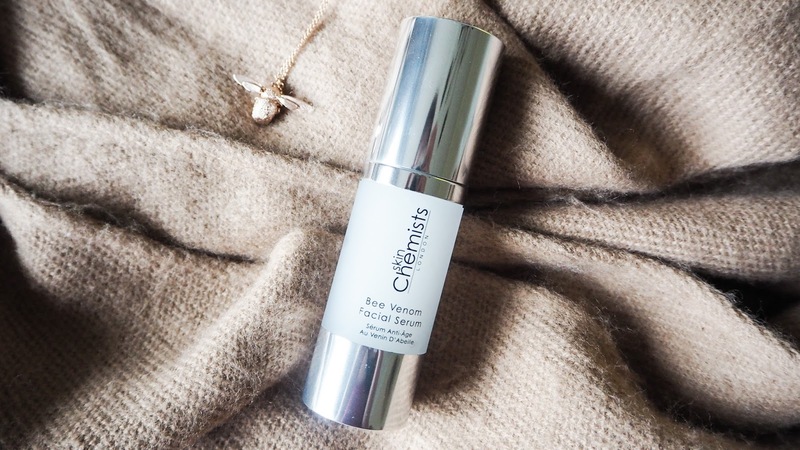 The Bee Venom is teamed with Hyaluronic Acid, which is known to help boost moisturise levels and Manuka Honey which is amazing at nourishing the skin. I’ve been testing the Skin Chemists Bee Facial Serum for two weeks now and the results are impressive. The bee venom gives an ever so slight tingle and my skin feels tighter, but at the same time, I notice it looks plumper due to the Hyaluronic Acid and Manuka Honey working together. I think this would be fantastic for anyone who is looking for an anti-aging product with instant results. I don’t have wrinkles or fine lines but I do really think it help with the way my skin looked. You could even use this before a special event to perk the skin up, making it easier to apply makeup. The serum has been easily slotted into my routine, every other night. 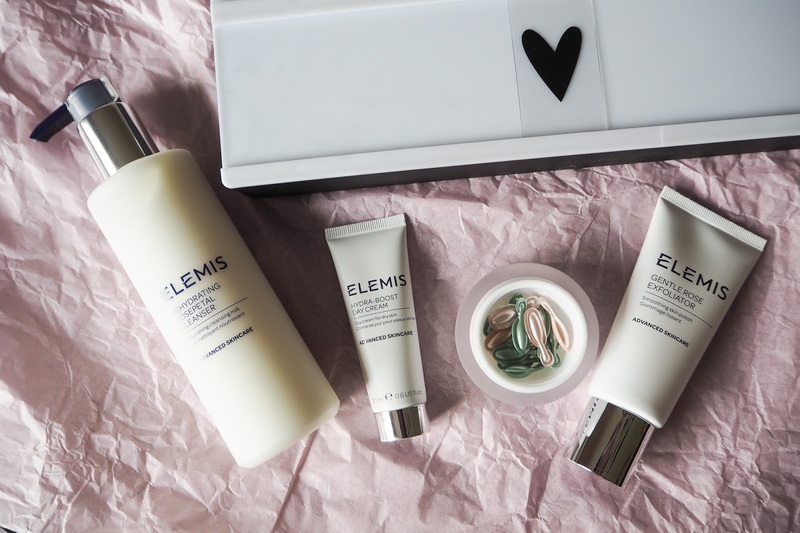 I’ll cleanse as usual with my Elemis Pro-Collagen Balm and then massage the Bee Venom Serum in. I find taking my time to active the product with massage really helps kick start the blood circulation increase. I’ll then pop a drop or two of oil onto the face. I can recommend the Skin Chemists Rose Quartz Youth Facial Oil or the Clarins Lotus Oil. To finish I apply a thin layer of Kiehl’s Ultra Facial Cream. This product is not suitable for those who are allergic to bee stings, and I advise anyone with hyper sensitive skin to give this product a miss. 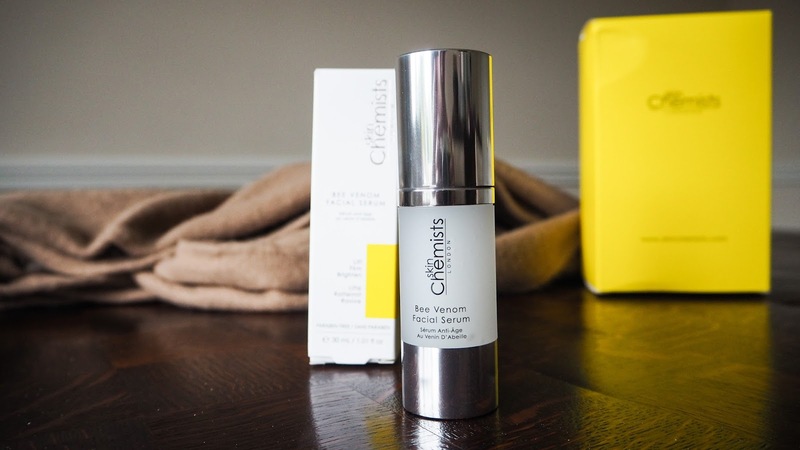 As I’m a Skin Chemist Ambassador, I have an exclusive discount code which makes this Bee Venom Serum discounted from £129 to just £19.99, just the code CHERRIESBLOG at the checkout. This is available until the end of March 2017, so don't miss out! I am also giving away 1 Bee Venom Serum away to one lucky winner. Use the Rafflecopter form below to enter! UK and EU only.